, a country girl of the name of Martha, which she changed for Catherine when she embraced the Greek religion, and came to be empress of Russia, was born in 1688, of very indigent parents, who lived at Ringen, a small village not far from Dorpat, on the lake Vitcherve, in Livonia. While yet only three years old, she lost her father, who left her with no other support than what an infirm and sickly mother could afford her; whose labour was barely sufficient to procure them a scanty maintenance. She was handsome, of a good figure, and gave intimations of a quick understanding. Her mother had taught hereto read, and an old Lutheran clergyman, of the name of Gluck, instructed her in the principles of that persuasion. Scarcely had she attained her fifteenth year, when she lost her mother. The good pastor took her home to him, and employed her in attending his children. 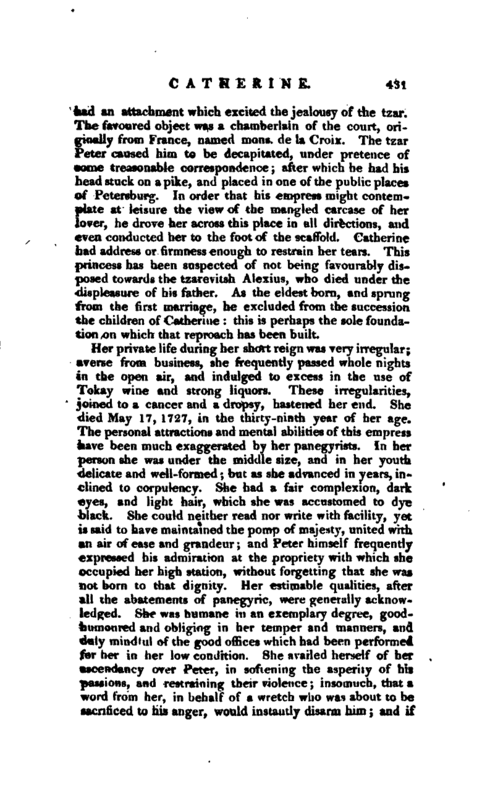 Catherine availed herself of the lessons in music and dancing | that were given them by their masters; but the death of her benefactor, which happened not long after her reception into his family, plunged her once more into the extremity of indigence; and her country being now become the seat of vv.-r between Sweden and Russia, she went to seek an asylum at Marienburg. In 1701 she espoused a dragoon of the Swedish garrison of that fortress. If we are to believe some authors, the very day that these two lovers had fixed on for plighting their faith at the altar, Marienburg was besieged by the Russians; the lover, who was on duty, was obliged to march with his troop to repel the attack, and perished in the action, before the marriage was consummated. Marienburg was at last carried by assault; when general Bauer, seeing Catherine among the prisoners, a’nd being smitten with her youth and beauty, took her to his house, where she superintended his domestic affairs, and was supposed to be his mistress. 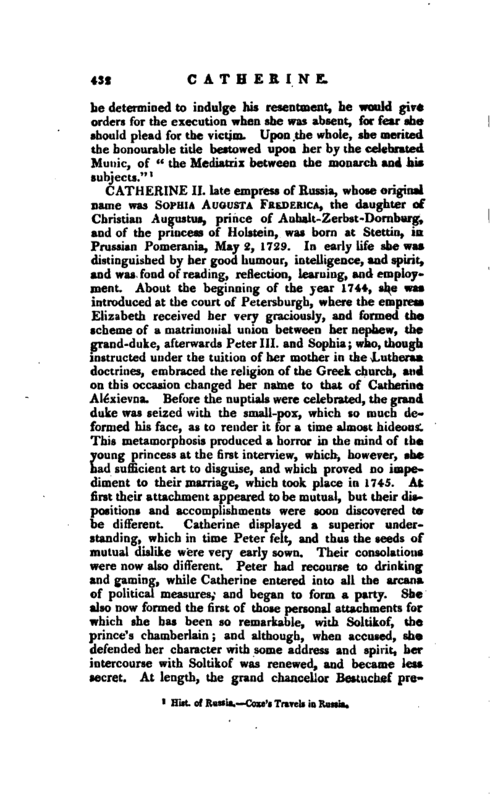 Soon afterwards she was removed into the family of prince Menzicof, who was no less struck with the attractions of the fair captive: with him she lived till 1704, when, in the seventeenth year of her age, she became the mistress of Peter the Great, and won so much upon his affections, that he espoused her on the 29th of May, 1711. 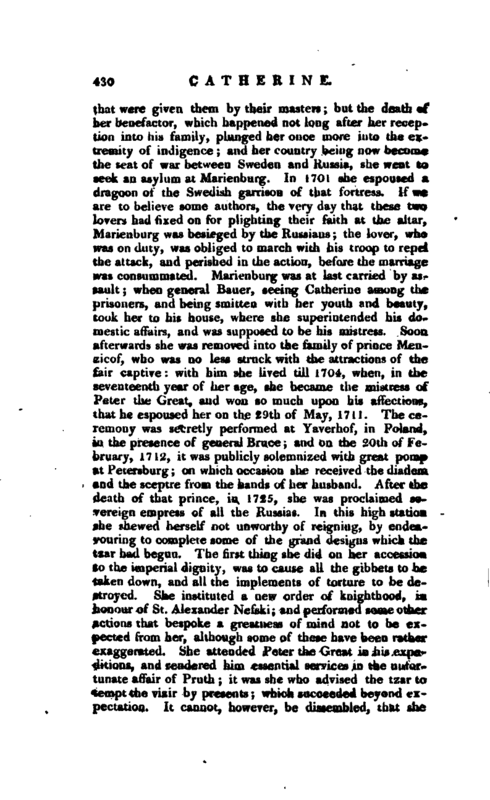 The ceremony was secretly performed at Yaverhof, in Poland, in the presence of general Bruce; and on the 20th of February, 1712, it was publicly solemnized with great pomp at Petersburg; on which occasion she received the diadem and the sceptre from the hands of her husband. After the death of that prince, in 1725, she was proclaimed sovereign empress of all the Russias. In this high station she shewed herself not unworthy of reigning, by endeavouring to complete some of the grand designs which the tzar had begun. The first thing she did on her accession to the imperial dignity, was to cause all the gibbets to be taken down, and all the implements of torture to be destroyed. She instituted a new order of knighthood, in honour of St. Alexander Nefski; and performed some other actions that bespoke a greatness of mind not to be expected from her, although some of these have been rather exaggerated. She attended Peter the Great in his expeditions, and rendered him essential services in the unfortunate affair of Pruth; it was she who advised the tzar to tempt the vizir by presents; which succeeded beyond expectation. It cannot, however, be dissembled, that she | had an attachment which excited the jealousy of the tzar. The favoured object was a chamberlain of the court, originally from France, named mons. de la Croix. The tzar Peter caused him to be decapitated, under pretence of some treasonable correspondence; after which he had his head stuck on a pike, and placed in one of the public places of Petersburg. In order that his empress might contemplate at leisure the view of the mangled carcase of her lover, he drove her across this place in all directions, and even conducted her to the foot of the scaffold. 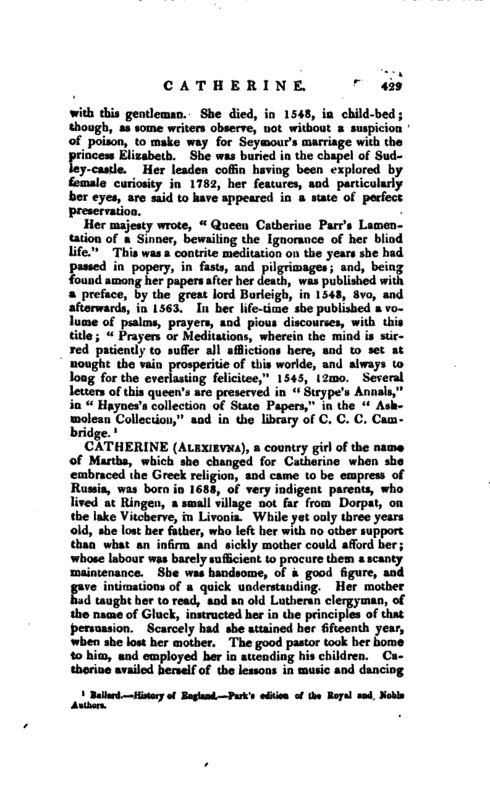 Catherine had address or firmness enough to restrain her tears. This princess has been suspected of not being favourably disposed towards the tzarevitsh Alexius, who died under the displeasure of his father. As the eldest born, and sprung from the first marriage, he excluded from the succession the children of Catherine: this is perhaps the sole foundation on which that reproach has been built.